It’s more of a journal entry than anything informational, but I still thought I’d share. My contractions started Monday, May 17. I went to the Prime Outlet mall with mom to do some walking & for her to get clothes for her trip the next week, & then we went to Whole Foods for lunch. On the drive home I noticed some contractions, but they were so light I don’t think I would have even realized what they were if I’d been doing anything. Tuesday May 18 I had a midwife appointment with Char Lynn & was 1 cm dilated. She said she could try to separate the membranes, I wasn’t really sure what that meant, but it ended up not working anyway. I got a herbal tincture to help start labor, & set up to make apt for Friday with an OB-GYN to be “approved” to have my baby at the birthing center, since I was more than a week overdue. Noticeable contractions started Tuesday afternoon. I used an iPhone app to time them, which made it very easy. I did LOTS of walking Tues-Thurs in Artisan Park with mom & dad. It was nice in the evenings but really hot during the day. We got one of those little spray bottles with a fan which helped some. The whole time I really didn’t feel sick of being pregnant like I hear some people say, I just knew that I did NOT want to have him in a hospital, & if I went too far overdue Florida state laws require that, so I felt pressed for time in that sense. I took the herbal tincture Tuesday & Wednesday, every hour for 6 hours or whatever the bottle said, until Wednesday I started to feel dizzy. Then I called Char Lynn & she said to stop them, that the alcohol in them was too much for me or something like that. Mom & I went to Jenna’s to visit while walking on Tuesday at 8:40 pm & Thursday at 8 pm. Tuesday was fun, but Thursday I just felt uncomfortable, I was having such hard contractions. They stayed about 7-8 minutes apart when I wasn’t walking, 2-5 minutes when I was. Thursday the midwife on call switched from Char Lynn to Marianne. Thursday night/Friday morning at 2 am I woke up shaking, Landon called Marianne who said we should come to the birth center. The drive there was the only time I listened to music while in labor. There were police outside for the Ally Gator bar, which we thought was strange. I was 2 cm dilated but she wanted to keep me there to monitor me, so we went to sleep. It was a hard bed & I timed contractions all night, & was up for the bathroom a lot. In the morning we drove to New Port Richie to see the OB-GYN, I was extremely uncomfortable in the car. We got there, did paperwork, a non-stress test, ultrasound, & listened to scare tactics – risk of still birth, shoulder discotia, that I was too small for 9 lb baby, & might need C-section, etc. She said I could try Castor Oil for induction. I was 3 cm dilated, & it was extremely uncomfortable when she checked my dilation. I realize now that she probably separated my membranes without bothering to ask or tell me, which ticks me off, but she gave me until Sunday May 23rd to have my baby out of a hospital, which accomplished why I went there. I had a whole wheat bagel & black cherry smoothie from Panera for lunch on the drive back to the birth center. Once we got there we watched High School Musical 3, & then decided to go home to sleep in our own bed. Mom, Dad, & Faith came over & brought us dinner, I don’t remember what because I didn’t eat it. I was having very hard contractions & was still shaking since that morning. I sent Landon to Publix for sweet potatoes because I didn’t want to eat anything else, but he forgot to get them & came back with Silly Bandz instead (funny now, not then.) He also went to Walgreens to get Castor Oil for the next day. I laid in a hot bath a lot that evening to keep from shaking, & I just felt better in there. Landon called Marianne to see if she had any suggestions & she said I could try a little (4 oz.) wine to stop the shaking so I could hopefully sleep. Landon went back out for wine, bought Strawberry Wine at Mobil, & ironically ran into youth kids while buying it. I drank 4 oz wine, (my first drink ever, besides Communion at Grandma’s church) but threw it up immediately. Tried again a little later, slept a little. I ended up awake most of night though, with just a little sleep in bathtub for about an hour or two. Saturday May 22 I got up around 8 am, my contractions were about 2 minutes apart. At that point I felt like this couldn’t possibly last much longer. After talking with Marianne that morning we decided to skip castor oil because she was concerned the effects on my body would be too exhausting when I was already so sleep deprived. Initially I thought I just wanted Landon there when the baby was born, but I decided the night before that I wanted my parents to be at the birth center too, so Mom & Dad came over at 9 am, & we drove there in van. Once we got to the birth center, I sat on birthing ball, & rocked against table & wall to help baby drop or something. Deep breathing really helped during contractions, & rubbing my own back did too. I had been having really bad back labor the whole time, & didn’t like anyone else rubbing it because they just couldn’t do it like I wanted at the time & it was too much work to try to tell them. They kept forcing me to eat. I did not feel like it at all, but I had dry Cheerios out of a ziplock bag & some vitamin water. My water broke around 11 am, mom heard a “pop” & asked, & I realized that it felt like I wet my pants so it must have broke. It was a pretty small amount of fluid. Marianne did some kind of test on it to confirm that it was my water that broke. I was 8 cm dilated then. I got in bathtub after that, which helped a lot. Landon kept me company in there, because as usual I didn’t like to be alone. I had one super long contraction (5-10 minutes) & called Marianne in. She said that a lot of times the final contraction is extra long, so I got out of tub & started to push – standing, birthing chair, hands & knees, etc. but nothing worked. When I started pushing (noon) I asked how long it would take & Marianne said usually a few minutes to an hour or two. I find that funny now. Charlie had gotten there while I was in the tub. 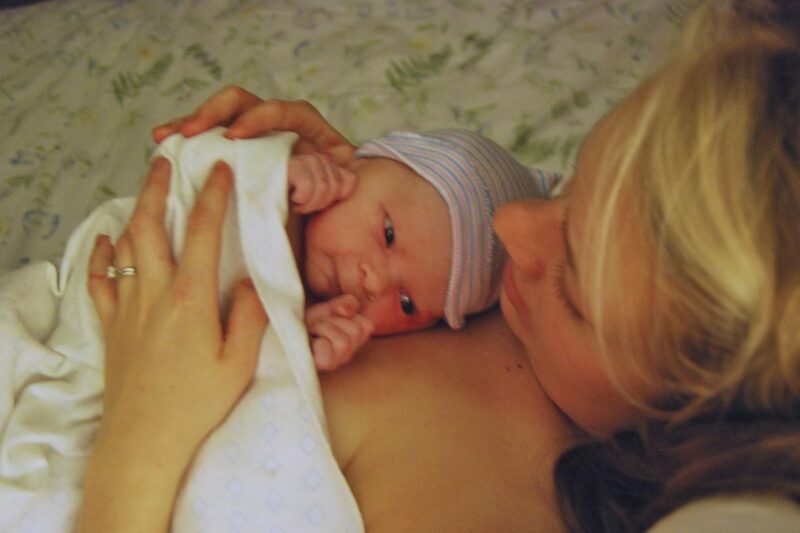 I was glad she was going to be my birth assistant because I felt like she would be on the same page as me for the most natural birth possible, and I knew her better than anyone else because she had taught all the labor & delivery classes. I did lots & lots of pushing. I was almost falling asleep in between contractions, I was so exhausted from not sleeping the 2 nights before. Marianne talked about having to transfer to a hospital if I didn’t make progress in the next hour around 4 pm, but I did not want that. After all I’d been through already there was no way I was going to get a C-section now. Kaden was posterior, which I guess is why I was in labor for so long, had such bad back labor, & pushed for so long. Marianne helped coach me a lot with the pushing. I think she wanted me to be more confident in myself & do what my body felt like but I just was not feeling that confident in myself. Next time I’ll know what it’s like so I think it would be easier to trust my instincts, but I’m glad she & Charlie & Landon were there to be confident for me. Their saying that I was doing it right and that I could do it really helped me get through everything. I had to use catheter, which was not pleasant, but it was also not as bad as Charlie made it sound in Labor & Delivery classes. They forced me to drink water, vitamin water, eat peanut butter, & honey. I didn’t especially want to at the time, but I needed it. I don’t think I was especially moody or anything, but I do remember getting mad at Landon for eating around me. Hours later we were still pushing. When they got a mirror for me to be able to see the progress it made me push much more effectively. Once he was down far enough that I could feel top of his head, it felt much more real that he was really coming. The “Ring of Fire” thing when the baby crowns is real, but I didn’t really care at that point, and the hot compresses definitely helped. Charlie was checking Kaden’s heartbeat pretty frequently. They said they were impressed with how strong we both were. At one point I think they had me not push for a contraction, & then Kaden turned the right direction (from posterior to anterior) on his own. After that he was born pretty quickly. Once his head was out it just took another push. Marianne said “now pick up your baby” so I did. That was the most incredible feeling in the world. I’ve never been so happy and so relieved in my life! He was so beautiful & perfect, not “ugly newborn” at all. His little eyes were so big & wondrous, & his hands were so tiny & sweet & just everything about him was completely precious. He was born at 9:01 pm. The second I held him everything we’d been through all week was completely worth it. I was surprised how big he seemed, he wasn’t how I imagined a newborn. He had a lot of hair & it looked like a faux-hawk right away, which was funny, although they put a hat on him so you couldn’t see it anyway. Mom said he had a pretty pointy head at first, but I didn’t notice. They gave me a shot of Pitocin in my leg after he was born, because they were concerned about me bleeding too much or something. I didn’t really care about that either then. Dad went to get us Subway. I was glad that we ended up having mom & dad there in the living room because it was nice to have them keep everyone updated through texting, & run & get us food (& pray for us!) Also I just felt more comfortable since Landon was still not feeling 100% from being sick, that if he had needed to rest or something they would have been there. I think it was special for them too, to get to see Kaden right after he was born. Sometime shortly after Kaden was born (maybe 15-30 minutes?) he stopped breathing. That was scary, but I didn’t really freak out or anything. I just didn’t think God wasn’t going to let anything happen to him. Marianne seemed a little shook up by it. That’s when they cut the umbilical cord, so she could rub his back & use the little tube sucker thing (later learned it was a De Lee suction) to get stuff out of his lungs. They weighed him maybe an hour later & he was 8 lbs. 15 oz. He’d already pooped twice so they said he was definitely 9+ at birth. I was able to nurse Kaden pretty soon after he was born. I had been a little nervous about breastfeeding, since it was obviously something I’d never done before, but it really felt very natural. Charlie helped with how to hold him & make sure he was latched on correctly, which helped me feel more confident too. I ate my Subway but they made me have some chicken broth first. They also made me have juice & yogurt & take a shower. The shower was nice, but Charlie wouldn’t let me shave my legs. I couldn’t believe how swollen I was, no one warned me about that (but I guess 9 hours of pushing can do that to you.) And my stomach was all stretched out, which I didn’t really like, but didn’t especially care then either. I made Landon video tape the birthing center before we went home, while I was holding Kaden on the couch. I said goodbye to Charlie & told her I was glad she & Marianne were the team I got. She said any other midwife would have probably made me transfer to a hospital, so then I was even more glad! We left for home around 1 am, and I was so tired. I could not believe I’d just done that. The Ally Gator bar next door was packed, police & all. Kinda creepy, but once again, I really didn’t care then. I was just so tired & so happy & so relieved. I think I started pushing a couple hours too early. I didn’t know then, but I definitely wasn’t having pushing contractions when I started, for at least probably the first hour. Next time I think less walking while in labor would be better, so I could save more energy. It was very draining. More walking during pregnancy, but less during labor. Less rigid timing contractions would be okay too. Especially throughout the night. The bath tub was a HUGE help. Will do again. Anything to possibly help avoid a posterior labor would be worth trying. For some reason, I think I’d gathered from somethings I read maybe, I thought that when I went into labor I wouldn’t be able to think clearly or remember what I wanted & didn’t want, but that was definitely not the case. I could think & remember fine, it was just like I was working really hard, like a really tough workout. So there is Kaden’s birth story! It’s pretty long, but I guess that’s appropriate for a 102 hour labor! Reminds me so much of my 120 hour 1st born labor 🙂 Whew! Thanks for the story and Happy Birthday to Kaden! When it comes to being a daughter in law, wife, and momma, you are a rock star all rolled up in one superwoman! I am amazed by you! Love you much!! This was and amazing day. I am so glad Dad and I were there to be a part of it. You are truly stronger than I ever imagined possible.